Caramel apple cake inspired by the popular Rocky Mountain Factory treat. Inspired by the popular Rocky Mountain Chocolate Apple Pie Caramel Apple, my new Caramel Apple Cake is made up of caramel cake layers, apple pie filling, salted caramel, white chocolate buttercream, and a light dusting of brown sugar and cinnamon. The other day in one of my cake classes, someone asked me how I come up with my cake flavors. She said, “do you just eat other dessert and think, ‘this can be cake’ ?”. Yes! That’s exactly what I do! It’s how I came up with my Tonight Show Cake, my Everything but the Kitchen Sink Cake, my Peach Crisp Cake, and so many more. I get so much joy and satisfaction from creating cake flavors that will remind you of other non-cake desserts. I love when it works out as perfectly as this Caramel Apple Cake, inspired by the Apple Pie Caramel Apple by Rocky Mountain Chocolate Factory. I recently made my Tonight Show Cake for a wedding. While eating scraps of the caramel cake layers, I started thinking of new flavor combinations for the caramel cake. I have only used it in the Tonight Show Cake. (Which is a total crime because the caramel cake is amazing). 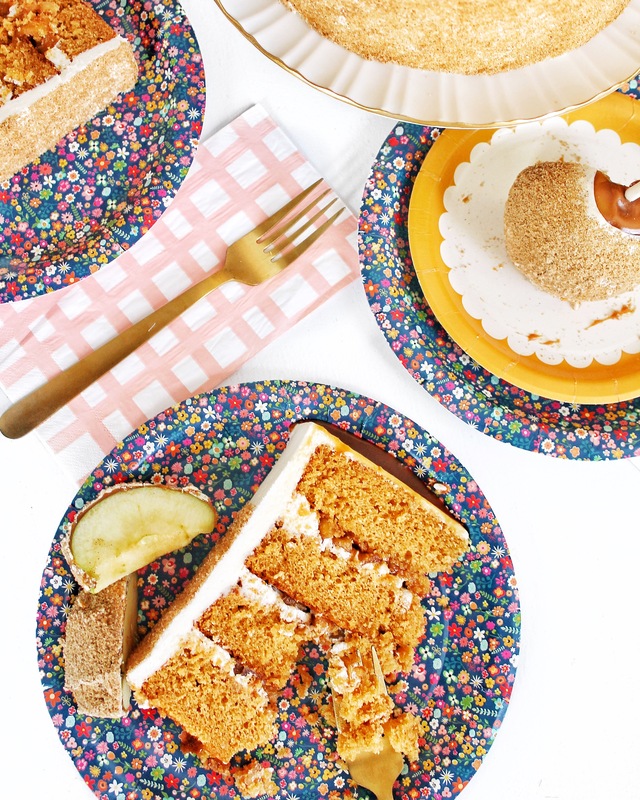 The caramel cake is actually a Milk Bar recipe, and there’s nothing I’d do to change it. It’s tender, moist and super flavorful, thanks to a huge amount of dulce de leche in it. (Not sure you’ll find a bigger fan of Christina Tosi and Milk Bar than me). As I was thinking about what to pair the caramel cake with, the Rocky Mountain Chocolate Factory Apple Pie Caramel Apple came to mind. 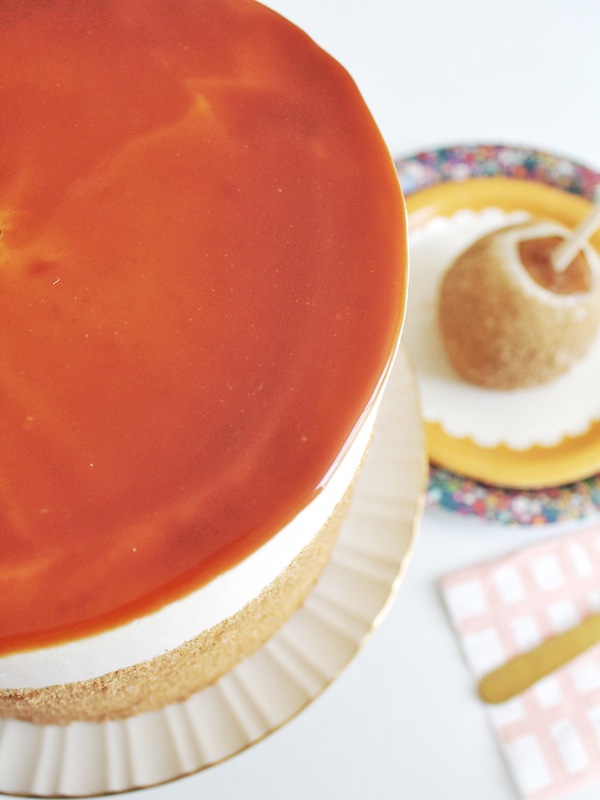 It’s my favorite caramel apple and sounded like the perfect treat to recreate in cake form. With Milk Bar already on my mind, I decided to use their apple pie filling from the Milk Bar Apple Pie Cake. I then added my white chocolate frosting, salted caramel and a light dusting of brown sugar and cinnamon – just like the caramel apple. First, each cake layer needs to be completely level. I use a cake leveler to cut each of my layers after they’ve baked and cooled. 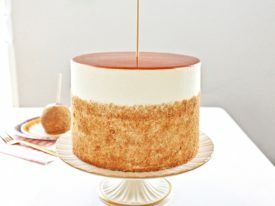 To get the caramel to stay on top of the cake, and not drip down the sides of the cake, you’ll want the cake to be completely even. Second, you’ll frost each cake layer with a little bit of frosting and then pipe a rim around the edges so the apple pie filling doesn’t spill out. You want to secure the filling into the frosting by patting down the apples with the back of a fork. You’ll then drizzle caramel over the apples and repeat with the other three layers. Remember, the last layer always gets placed crumb-side (top-side) down. After stacking the cake, you’ll apply a thin layer of frosting around the entire cake to lock in the crumbs. Put it in the freezer for 10 to 15 minutes to set before frosting the rest of the cake. When the crumbs are locked in, you’re ready to frost the rest of the cake. To apply the brown sugar and cinnamon mixture, just put some in your hands and gently let the mixture fall from your hand to the side of the cake. (I have a video on Instagram to show you what I’m talking about). Alright, time to pick those apples and get backing. 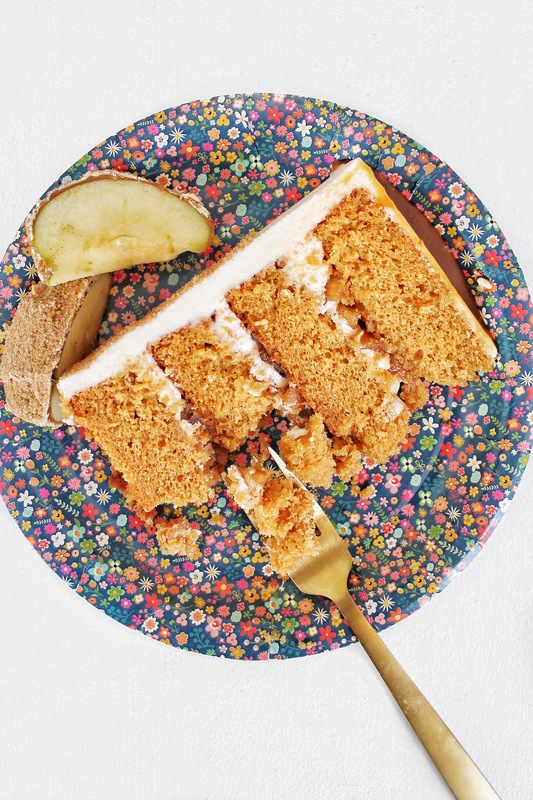 This Caramel Apple Cake is going to the perfect addition to your Fall gatherings! 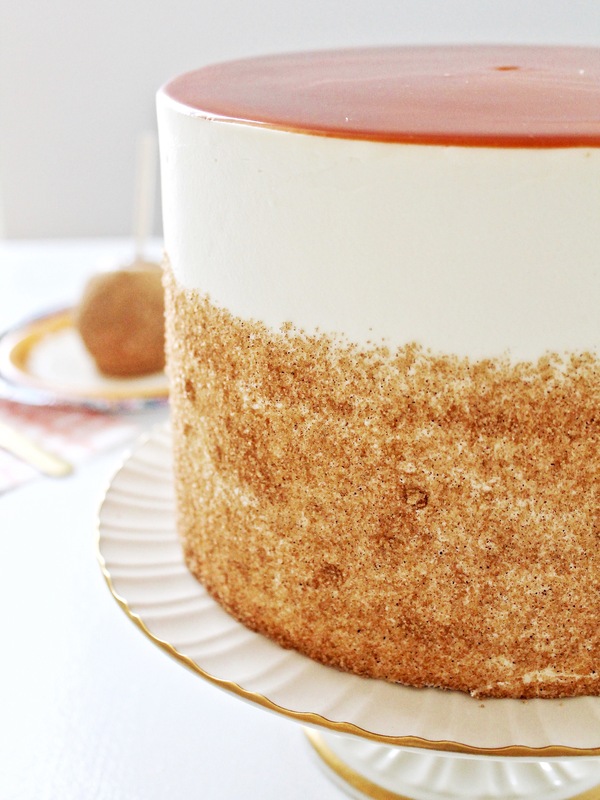 Caramel cake layers with apple pie filling, salted caramel, white chocolate buttercream, and a brown sugar and cinnamon dusting. Heat the oven to 350 degrees F. Spray four 8-inch round cake pans with nonstick spray, line with parchment paper and spray again. Set aside. Evenly distribute the cake batter in the four pans, about 18 to 19 ounces of batter in each. Bake the cake for 23 to 25 minutes. The cake will rise and puff, doubling in size, but will remain slightly buttery and dense. To check if it's done, gently poke the edge of the cake with your finger. The cake should bounce back slightly and the center should no longer be jiggly. Leave the cake in the oven for an extra 3 to 5 minutes it if doesn't pass this test. Peel the apples, then halve and quarter them. Put each apple quarter on its side and cut a small slice down the length of the apple to remove the seeds and core. cut each apple quarter lengthwise into thirds and then crosswise into fourths, leaving you with 12 small pieces from every apple quarter. Place the apples in a medium pot with the butter, brown sugar, cinnamon, and salt. Slowly bring to a boil over medium heat, using a spoon to gently stir the mixture as it heats up and the apples begin to release liquid. Reduce the heat and simmer the apples gently for 3 to 5 minutes. Be careful not to cook the apples so much that they turn into applesauce. Slowly add the cooled white chocolate while mixing on medium-low speed. Once the cream is mixed in, add the salt, and vanilla. Stir to combine and then set aside to cool to room temperature before using. Place the first cake layer, top side (crumb side) up. Apply a thin layer of frosting over the top of the cake layer and pipe a rim of frosting around the edge of the cake layer. Fill the center with the apples (not using any of the liquid from the mixture). Pat the apples down with the back of a fork to set them in place and help create a level surface to stack the next cake layer on. Drizzle some salted caramel over the apples. Repeat step 1 with the next two cake layers. Place the final cake layer top side down over the last layer of filling. Apply a thin coat of frosting around the entire cake to create crumb coat. This layer of frosting does not need to look perfect. It's just to lock in the crumbs. Freeze the cake for 10 to 15 minutes to set the crumb coat. After the crumbs are locked in, you can frost and decorate the cake. For the caramel on top, I pour the caramel in the center and gently spread it to the edges with my offset icing spatula. Hi Courtney! If I use vegetable oil instead of grapeseed, do I still use 1 cup? Also, can you find dulce de leche in a grocery store like Kroger? I recommend grapeseed oil. It’s a lighter oil that vegetable oil or canola oil and creates a lighter, fluffier texture. 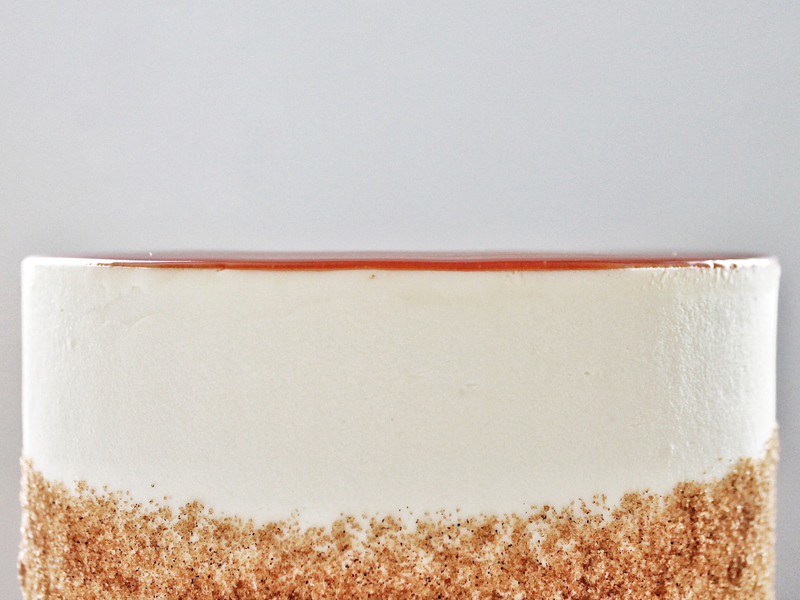 Yes, you should be able to to find dolce de leche at Kroger – usually in ethnic food area or baking. Do you have to use grapeseed oil? Can I use another oil instead? I do recommend grapeseed oil. It’s a lighter oil that vegetable oil or canola oil and creates a lighter, fluffier texture. 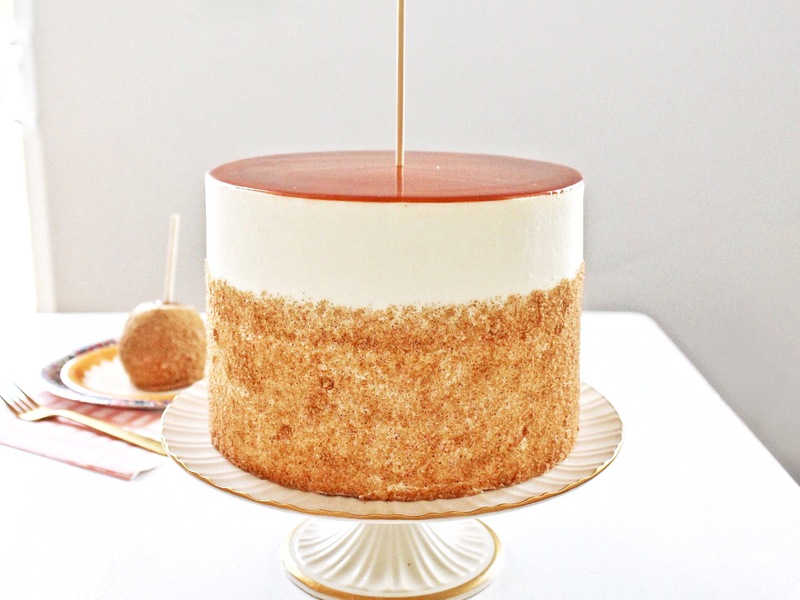 I have a question about the caramel center layers; do you find it disappears into the cake? Sorry let me clarify my last question: homemade salted caramel sauce. Think it will disappear into the cake layers? So I put a little frosting down between the cake and the filling, that helps the filling not to seem into the cake. I also drain the extra sauce from the apples, so I’m just using the apples and then the salted caramel stands out more. It doesn’t really disappear into the cake layer above it, in my experience. What type of white chocolate do you recommend for the buttercream? I like Guittard or Ghirardelli. hi courtney! 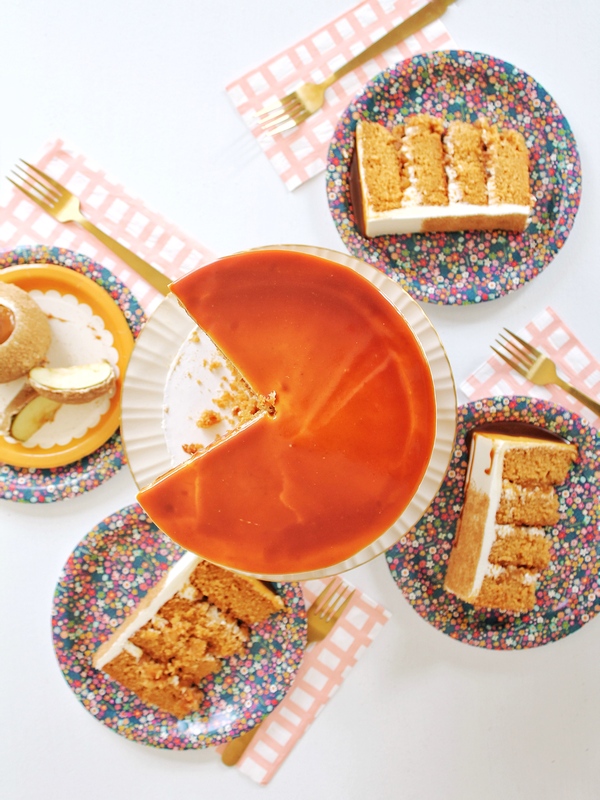 can i make this cake in 3 6″ pans instead of 4 8″ pans? i only have 3 8″ pans so was trying to avoid having to do the dance of waiting for the fourth 🙂 thanks! Hi! I’m a little confused about the grape seed oil mentioned in other comments, where in this recipe does it call for that? In the ingredients list it says 1/2 cup vegetable oil. I’ve since updated the recipe and no longer use grapeseed oil. Just vegetable oil. Your directions for the salted caramel sauce mention vinegar, yet it’s not on the ingredient list. What is the measurement? Sorry, just omit the vinegar. I’ve taken that out of the recipe. Hi Courtney! Can I make this is in 3- 8″ pans instead of 4? I only have 3. Yes you can but your layers will be much thicker and the bake time will be longer. I’d actually measure out the batter for 3 of the 4 pans and then bake the last pan separately for about 5 minutes less. The batter will be fine at room temperature, covered, during that time. Made it! It’s a fantastic recipe! Delicious creamy icing, great apple filling, tender flavourful cake. Thank you so much! Yay! So happy to hear you love it as much as I do!